Your teenage years are often filled with new experiences, and one of the most exciting of these is learning how to drive. And then, if all goes well, finally being able to drive completely on your own. Kings Driving School makes this dream come true with private teen driving lessons in Glendale, Burbank, La Crescenta, La Cañada, Flintridge, Pasadena, North Hollywood, and Eagle Rock. If you are at least 15 ½ but under 18 years of age, you can apply for a provisional driver license. Call us at 818-265-9551 to learn how to apply for a permit if you are under 18. 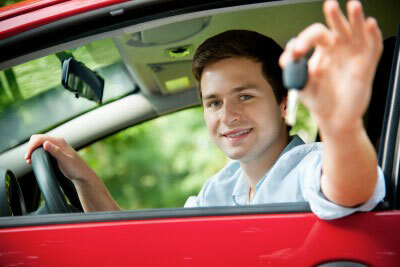 When you turn 16, you can take the driving test to obtain the California Drivers License. If you want to give the gift of driving for any of the teen driving lesson plans listed below, you can order a gift certificate. Click here to learn more. We pick up teen students at home, work, or school for their private driving lessons in these student trainer cars. Teen students will learn and practice all the basics of driving a car, such as how to react in emergencies, handle different driving conditions, maneuver a car on the streets and highways, merge with traffic, turning, parking, starting on an incline, and much more. After completing the min. 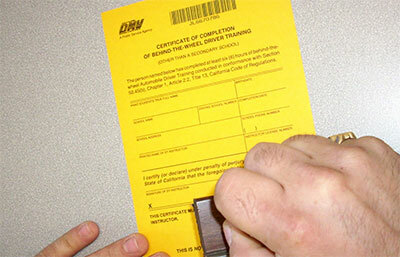 6 hours of behind-the-wheel driving lessons, we issue you California's DL 400D DMV CERTIFICATE. In order to take your DMV driving test, you are required to take this DMV Certificate to a local DMV field office. We recommend you schedule your DMV driving test appointment ahead. If you need to rent any of our student cars for the DMV driving test, we offer a 1 HOUR PRACTICE TEST with an instructor prior to your test on the same day. This service costs between $110 - $130 depending on which DMV office you visit. Give the gift of teen driving lessons by ordering a gift certificate.